Fire at Fourth Reactor: Is Worse Yet to Come in the Fukushima Nuclear Disaster? 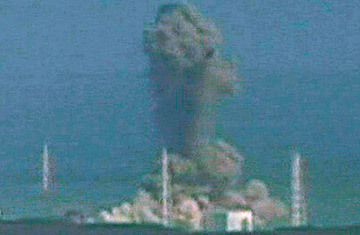 Smoke ascends from the Fukushima Dai-ichi nuclear plant's Unit 3 in Okumamachi, northern Japan, Monday, March 14, 2011. Chernobyl, the infamous atomic power plant in northern Ukraine, is getting ready for an anniversary. It will be 25 years next month since Reactor No. 4 exploded, causing the worst nuclear disaster in human history. A huge section of Europe was covered in a carcinogenic haze after the April 1986 explosion; and the towns and villages around the power station are still practically uninhabitable. Thousands are thought to have died of cancer as a result of the fallout. Now the world is faced with another nuclear nightmare at Japan's Fukushima Dainichi power plant, which has been brought to the brink of a meltdown by the earthquake and tsumani that struck Japan on March 11. In an interview with TIME, the engineer in charge of dealing with the fallout from Chernobyl, Andrei Savin, warns that history could indeed be repeating itself in Japan. He says the government in Tokyo is clearly underestimating the scale of the disaster, which will likely require years of work to cleanse the surrounding buildings, topsoil and vegetation of radioactive particles  and that's only if the situation does not get any worse. "Right now the situation around the [Fukushima] power station is already much more serious than what we have today around Chernobyl," says Savin, the chief engineer of Project Uktrytiye, or Enclosure, the group of scientists charged with the continuing effort to seal off and clear out the radiation from Chernobyl. "Walking around Chernobyl is much more safe than being anywhere near the damaged plant in Japan right now. So the risk to human health there is already serious." That is mainly because of the radioactive iodine that has already been detected around Fukushima after the explosions and fires it sustained in the past several days. "The human body absorbs these particles very easily. They get into the thyroid gland and gradually destroy the immune system," says Ivan Blokov, program director of Greenpeace Russia and an expert on nuclear accidents. "In Chernobyl that was the main cause of illness in the immediate aftermath, the radioactive iodine," which is especially dangerous for women and children. But this toxin naturally dissolves after around eight days, meaning that the long term threat of radiation would come from other substances, such as cesium, which has already been detected around Fukushima, and plutonium, which poses the greatest danger if the nuclear fuel rods inside the reactors melt. Savin, speaking by phone on Tuesday from the Enclosure Project's headquarters in the Ukrainian town of Slavutych, about 50 kilometers northeast of Chernobyl, says the explosions in three of the reactors at Fukushima make it almost certain that the fuel rods have started melting. "This means that cesium has likely been thrown into the atmosphere already," Savin says. "If it stops there, then after a certain period of time it will settle along the path of the radiation cloud and the situation will stabilize." The nightmare scenario, however, would unfold if rescue workers fail in their frantic attempts to cool the fuel rods, as they've been trying to do for several days. "The likelihood is low but it still exists," Savin says. "If one reactor has a full meltdown, and you reach a critical mass of melted nuclear fuel built up inside the reactor, it could cause an atomic explosion." Other experts say they wouldn't use the word "explosion" for such an incident. Says Alexander Uvarov, the editor of Atominfo, a Russian online journal on the nuclear industry: "I wouldn't personally use that phrase, simply because in the public mind that phrase evokes the image of Hiroshima. But yes, it is an explosion, or perhaps more like a very large burst." Such a blast would certainly not have nearly as much force as an atom bomb, Savin agrees, but it would pump a large radioactive cloud into the atmosphere that could then be carried by the wind. "That's when the situation would start to look a lot more like Chernobyl for many years to come." Adds Uvarov: "The best way to prevent that is by covering the fuel with a thick layer of water, as they've been trying to do [at Fukushima]. Of course that water will continue to steam away from the super-hot fuel, but if the layer is thick enough you would not have that explosion." But, he adds, "if the melted fuel does gather inside the reactor and is exposed to the air, it could indeed explode, and that would spray all kinds of nasty particles into the atmosphere." This prospect, as well as the series of explosions at the Fukushima complex over the past four days, makes the Japanese government's treatment of the disaster seem reminiscent of the Soviet government's head-in-the-sand response to the Chernobyl meltdown back in 1986. At first, Moscow initiated a cover-up, and only informed the world when a nuclear plant in Sweden noticed a radiation spike in its atmosphere more than 1,000 kilometers away. Japanese authorities have been much more forthright, but on March 13, the Japan Atomic Energy Agency classified the explosions as a Level 4 event on the International Nuclear Event Scale, meaning it is an accident with local consequences. Chernobyl was the only one in history to be labeled a Level 7 event, the worst possible, and three Russian experts interviewed on Tuesday say Fukushima deserves at least a Level 5, or even a Level 6 rating, as was assigned on Tuesday by the French nuclear safety authority. "There is the sense that the Japanese were either unprepared or had serious flaws in their contingency plans," says Uvarov. "There has not been full disclosure about the situation there. Of course I can understand the desire to contain panic, and to save the ugly details for a better time. But that leaves experts to draw conclusions from available facts, which are so far not encouraging." At the very least, the facts suggest that a quarter century after Chernobyl, the world has still not immunized itself from the threat of such disasters. They are the price the world inevitably pays for nuclear energy, and now it is Japan's tragic turn to foot the bill. The total cost  in human lives, sickness and environmental devastation  will only become fully clear years from now, once the fallout from Fukushima runs its course. See how you can help victims in Japan. See TIME's complete coverage of the Japan earthquake.